What’s it like when your boss knows you have won the lottery before you do? Ask Mr. Reynolds who works at the produce department of the Hy-Vee at 4064 E. 53rd St., in Davenport. 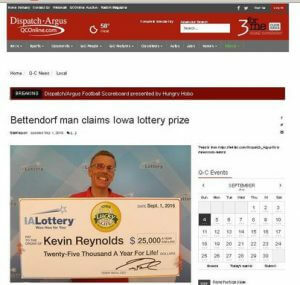 When the store sold a winning ticket the managers reviewed security footage which seemed to show Reynolds was the winner. His bosses then sat him down and asked him to check his tickets; that’s when he found out he had won a second prize of $25,000 a year for life. The winner says this will make his retirement a lot easier. He still plans to play the lottery from time to time.